Student activists have taken to more than just the streets in their efforts to halt tuition hikes. An unknown group of rabble-rousers have created an anti-tuition-hike website nearly identical to the Charest government’s pro-tuition-hike site. 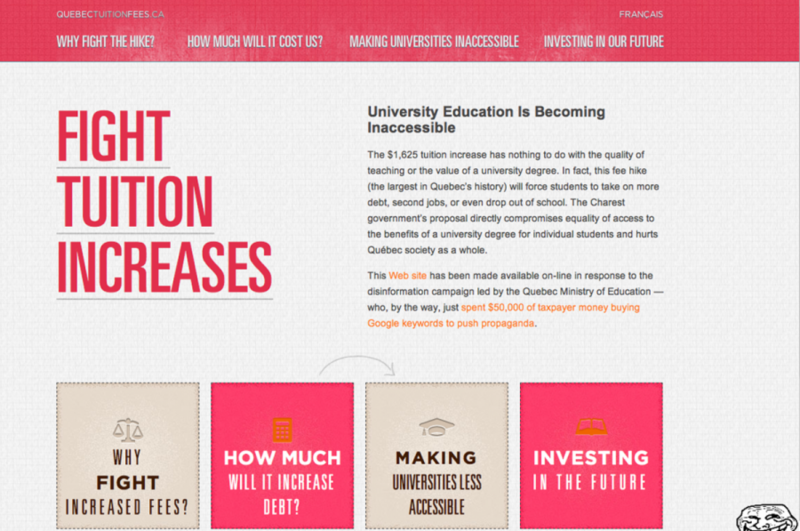 The original website, quebectuitionfees.com, was launched on the Nov. 10 Day of Action in an effort to counter the growing voices of dissent against the government’s plan. According to Concordia Student Union President Lex Gill, the Charest government spent $50,000 on Google keywords like “CSU” and “FEUQ” so that their website would be the first result in a Google search. Gill called this “astroturfing at its finest,” and was encouraged by the government’s website, saying it is a sign they’re losing the battle for increased tuition fees. “Trying to outsmart young people with technology is always a failed venture, and I don’t think this was any different,” she said. Within 24 hours of the launch of the original site, a group of unnamed students launched their own website, which includes information on fighting the tuition fee increases. The parody site has the same URL but with a .ca domain extension. The President of FEUQ, Martine Desjardin, was contacted, but did not return our phone call to comment. Neither did the office of the Minister of Education. Visit quebectuitionfees.ca for more information from about the fight over tuition hikes.